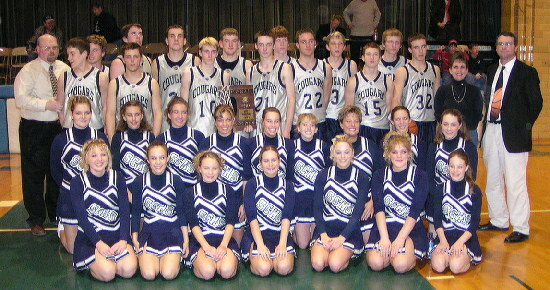 2004 St. Elmo Regional Champions !!! For the eighth time in the last ten years, the Cougars are crowned regional champions, this one coming by virtue of a 68-52 victory over the Cowden-Herrick Hornets at St. Elmo on Friday night. With the win, they will now advance to the Olney sectional for a first-round match-up against the Red Hill Salukis on Wednesday night. The final score in this one was not indicitive of how close the game was played throughout. Not until the final two minutes did the Cougars give themselves any breathing room as the Hornets battled toe-to-toe and stayed within 2-3 points for most of the way. The Cougars jumped out to a 16-13 first-quarter lead, but nothing seemed to come easy. The Hornets and their spread-the-floor zone defense, for the most part, kept the Cougars in check. Spencer Patton had a big quarter with a pair of steals that resulted in easy layups and added another hoop to lead the way. Still unable to solve the Hornet defense, the Cougars could only muster 9 points in the second frame and found themselves tied at 25 going into the halftime break. The second half started with a bang, as the Cougars came out with a pressing full-court defense that resulted in three quick turnovers and 6 points, but the Hornets regrouped and allowed only 5 more for the rest of the quarter. Heading into the fourth and the Cougars holding a meager 1-point lead, both teams traded buckets back-and-forth until the 2:43 mark. 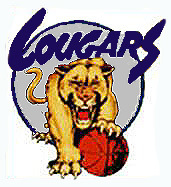 Leading 51-49, the Cougars then went on an explosive 17-3 run to pull away and lock up the title. Although the Cougars committed 21 uncharacteristic turnovers for the game, they were deadly from the free throw line (14-16) and shot over 50% from the field. Nathan Lotz was a perfect 7-7 from the field and 3-3 from the line to finish with 17 points and Brock Adams nailed a trio of 3-pointers and 4 buckets from inside the arc for his 17 points to share the game-high scoring honors. Patton (15) and Nick Jones (13) also contributed to the scoring cause with their double-digit effort. The Cougars will travel to Olney Wednesday night to play their first-round game with Red Hill, winners over Lawrenceville in their own regional. Brock Adams advanced in the 3-point shooting competition and will compete again before Wednesday night's game at approximately 6:50 P.M.